At this time of year, the main priority is working through an appropriate fertiliser and spray programme. Thankfully, crops are progressing better this year in comparison to last year; most crops are 7-10 ahead. Winter crops are looking very good at moment and we do not see any issues arising that are of major concern. Crops have had a much easier time this year and for this reason, crops are 7-10 days ahead of this time last year with nearly all T1’s on Winter Barley and T0 +PGR on Wheat almost completed at the time of writing. At this time of year, the main priority is working through an appropriate fertiliser and spray programme. In cases where T1 sprays were applied in the last two weeks of March, T2’s should be getting underway three weeks after T1 application. This should include using a robust rate of recommended fungicide chemistry and include a 2nd PGR like Moddus or Terpal where lodging risk is high. Again, this will be dependent on the crop and at Connolly’s RED MILLS, we are happy to assess this. Important diseases to watch out for are; Ryncho, Ramularia and Net Blotch. As a general observation, crops look relatively clean at the moment, but two rows are showing more disease than the six rows, with a mixture of all diseases being present and varying from field to field and across the varieties. The end of April will be the last opportunity to apply the final split of fertiliser, so it is important that this happens. 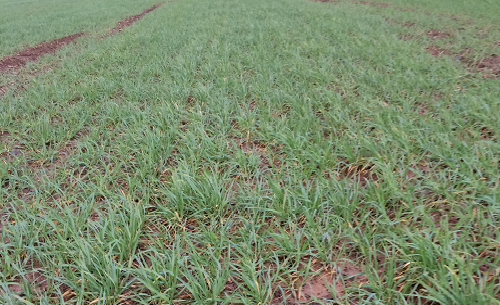 Winter Oat crops have mostly been taken care of with a growth regulator, weeds and fungicide apart from later sown Oats, but growers should keep an eye out for Mildew and Crown Rust. Most Winter Oat crops will need a holding spray until the head comes out. March sown crops will be due for weed sprays, wild oat, and aphids plus trace elements. Late March/April sown crops will be pushing into May before they will need attention for weed control etc. Thankfully, there has been great progress on Spring Barley plantings for spring 2019 which is well ahead of this time last year. It is a quiet time for Winter OSR as we are between spray programmes. All Nitrogen will have been applied and crops will have been sprayed with a fungicide however, growers should now be watching for the fall of first petals as this will indicate that the next round of sprays are required for the control of Sclerotina. Looking at crops currently, I anticipate this won’t happen until the middle to end of April but crops and areas will vary. It looks like being a protracted flowering period due to crops being forward and flowering a lot earlier this year. Where the risk of Sclerotina is higher, it may be worth considering a 2-spray programme from around the 3rd week April or at the beginning of the first petal fall, and about 3 weeks later. The fact that the flowering period looks like being more drawn out this year will make it more feasible to split applications in higher risk situations. Thankfully, nearly all crops escaped pigeon damage this year and are showing great promise at the moment so “fingers crossed” at this stage. Filan or Proline will be the products of choice for this issue. For further advice on crops and an appropriate spray programme, please do not hesitate to contact any member of the Connolly’s RED MILLS agronomy team.